She's been decorated by the Queen of England. Earned and given away hundreds of millions. Founded a thriving tech company at a time when she couldn't open so much as a bank account without her husband's permission. Changed her name to "Steve" on correspondence just to get a hearing from potential clients. And put her fortune to work supporting autism research in honor of her late son. Now that timeline of accomplishment for Stephanie Shirley includes a TED talk, given at the 2015 conference. My company, called Freelance Programmers, and that's precisely what it was, couldn't have started smaller: on the dining room table, and financed by the equivalent of 100 dollars in today's terms, and financed by my labor and by borrowing against the house. My interests were scientific, the market was commercial -- things such as payroll, which I found rather boring. So I had to compromise with operational research work, which had the intellectual challenge that interested me and the commercial value that was valued by the clients: things like scheduling freight trains, time-tabling buses, stock control, lots and lots of stock control. And eventually, the work came in. We disguised the domestic and part-time nature of the staff by offering fixed prices, one of the very first to do so. And who would have guessed that the programming of the black box flight recorder of Supersonic Concord would have been done by a bunch of women working in their own homes. When I started my company of women, the men said, "How interesting, because it only works because it's small." And later, as it became sizable, they accepted, "Yes, it is sizable now, but of no strategic interest." And later, when it was a company valued at over three billion dollars, and I'd made 70 of the staff into millionaires, they sort of said, "Well done, Steve!" You can always tell ambitious women by the shape of our heads: They're flat on top for being patted patronizingly. 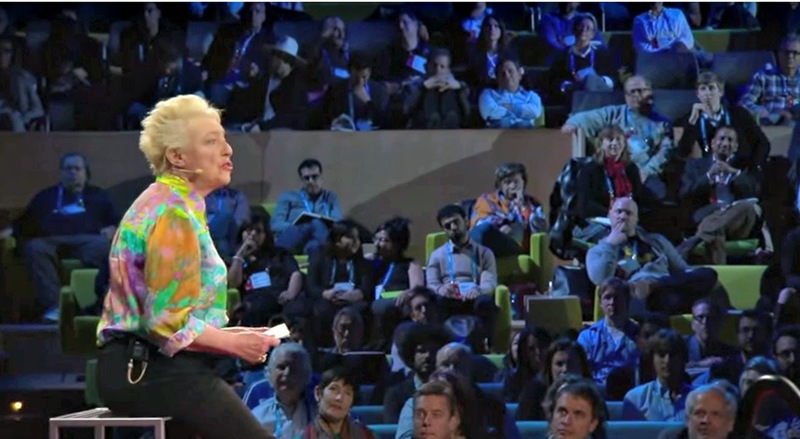 I'm so glad that, at age 81, Shirley took her story to the TED stage so she could tell it on her own terms--you get the idea that that's how she does things. What can you learn from this famous speech? Wear color: If I had a nickel for every woman speaker who wears black for a TED talk, I'd be a millionaire, too. Shirley stands out with a multi-colored blouse, vibrant and creative and a good foil for the dark background. No fading into the backdrop here. The founder's story never gets old: We are endlessly fascinated with how companies began, no matter how big or small they are today. These are stories no one else can tell as well as the founder (although every employee of any company should be able to tell, in a compelling way, the founding story). That this story includes universal elements to which anyone can relate--the dinner table founding, the small amount of capital, the employees working at home--makes it even more approachable, sticky in the memory, and captivating. Keep your cool: Not seen on the edited video, but very apparent at the conference, were a few false starts to this talk, thanks to faulty audio equipment. Frustrating as that was, Shirley kept trying that beginning until the problem was solved. It's a moment when practice, and lots of it, comes in handy, ensuring that you won't forget your start after one try.